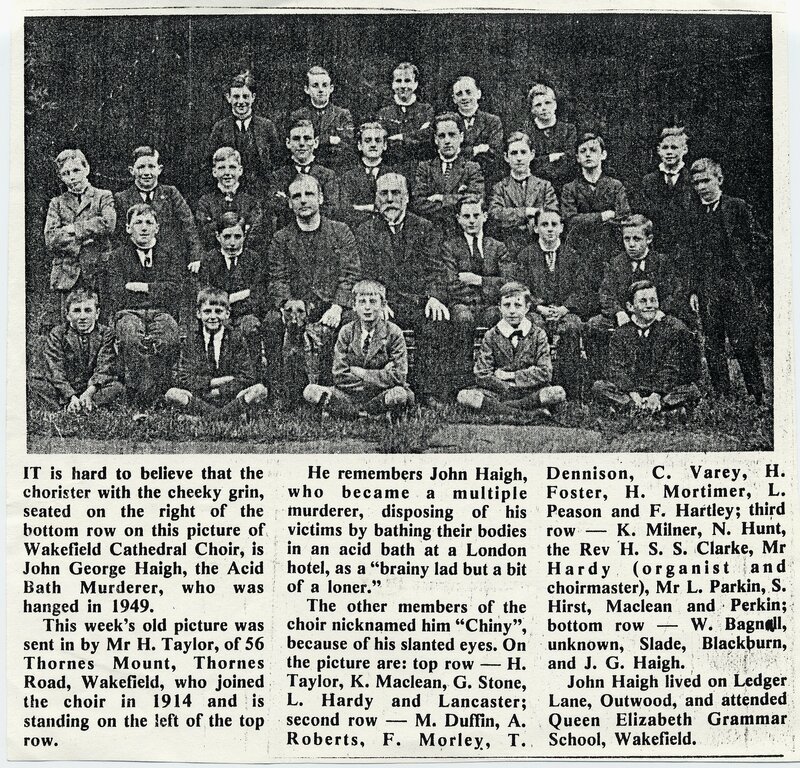 This article featuring an old photograph of the Wakefield Cathedral Choir, is about John George Haigh, the Acid Bath Murderer. The text indicates that a William Bagnall appears at the lower left of the photogtraph. The names in the list are however mistaken I believe since if Mr Taylor joined the choir in 1914 and is present in the photograph, William would have been at least 39 years old in 1914. I suspect that William is not present in the photograph, unless there is another William Bagnall from the Wakefield area. IT is hard to believe that the chorister with the cheeky grin, seated on the right of the bottom row on this picture of Wakefield Cathedral Choir, is John George Haigh, the Acid Bath Murderer, who was hanged in 1949. This week's old picture was sent in by Mr. H. Taylor, of 56 Thornes Mount, Thornes Road, Wakefield, who joined the choir in 1914 and is standing on the left of the top row. He remembers John Haigh, who became a multiple murderer, disposing of his victims by bathing their bodies In an acid bath at a London hotel, as a "brainy lad but a bit of a loner." The other members of the choir nicknamed him "Chiny", because of his slanted eyes. On the picture are: top row - H. Taylor, K.Maclean, G. Stone, L.Hardy and Lancaster; second row - M. Duffin, A. Roberts, F. Morley, T. Dennison, C. Varey, H. Foster, H. Mortimer, L. Peason and F. Hartley; third row - K. Milner, N. Hunt, the Rev H. S. S. Clarke, Mr Hardy (organist and choirmaster), Mr L. Parkin, S. Hirst, Maclean and Perkin; bottom row - W. Bagnall, unknown, Slade, Blackburn, and J. G. Haigh. John Haigh lived on Ledger Lane, Outwood, and attended Queen Elizabeth Grammar School, Wakefield.